Not every deer hunter bags a buck. And as Michigan’s John Wardynski has now proved, not every hunter who gets a deer, gets to keep it. Michigan’s MLive website reports the story of veteran hunter John Wardynski, who had an interesting encounter on the second day of Michigan’s regular firearm deer season. Wardynski was set up in a blind in Alcona County, about halfway up the east side of Michigan’s Upper Peninsula on Nov. 16 when the veteran woodsman had a first ever—and he hopes, once-in-a-lifetime—hunting experience. Wardynski videoed the incident and shared it with the world on Facebook. Wardynski had positioned his blind well. Eventually a healthy six-point buck strolled by within range, and the hunter made a clean shot. Wardynski left his blind and began following the buck’s trail to see where it fell. As he was walking, he looked back to see where he was relative to his blind. What he saw was a black bear standing right next to it. “The bear came down the ridge, then proceeded to parallel me as I walked my blood trail,” the hunter explained on his Facebook page. “Thought it was pretty cool to see a bear that close, so I started videoing with my iPhone. Wardynski didn’t think that was so cool. “Go on, get!” Wardynski can be heard shouting at the bear, in the video. “My deer! Go on! No, no, no! Though the bear wasn’t very large (“Not a very big guy,” Wardynski says of the bear in the video,) the bear definitely knew it had the upper hand. The bear, a common black bear such are plentiful throughout the state Michigan, ignored Wardynski, sauntered up to the downed deer, flipped it over, and began eating. 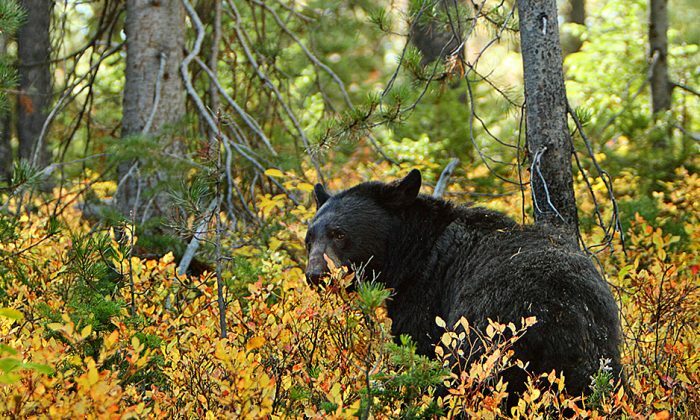 Michigan allows hunting of black bears, but hunters have to enter a lottery for a special permit—and the season ends in late October anyway. Wardynski said on his Facebook page that at points, he was within 40 feet of the bear, which he later referred to as female. Female black bears can reach 300 pounds while an male can weigh up to 500 pounds, so it is no surprise that when the bear turned toward Wardynski and advanced a few steps. Despite having hunted for more than 50 years, Wardynski had never found himself in this situation before. Wardynski can be heard releasing a few exasperated sounding sighs as he realizes his prey is going to be stolen right before his eyes. Wardynski wasn’t sure if the bear would drag the deer to its den, or drag it off and cover it, to eat at a later date. He wanted to come back and get the antlers, at least—but not at the cost of a closer encounter with a hungry bear. Wildlife management specialist Kevin Swanson of the Department of Natural Resources estimates that 9,700 black bears live in the Upper Peninsula and 15,000 in lower Michigan. Bears are due to head for the dens for winter hibernation soon. This one was probably hoping to pack on a little more fat for fuel and insulation through her long nap. One positive takeaway—besides some exciting memories and some pretty unique video: Deer season lasts until the end of November. Wardynski has time to try again. The odds of another bear encounter must be pretty low.